Let's face it. Without a total commitment towards client satisfaction, today's "buzzwords" are nothing more than hollow jargon. So when deciding with whom to entrust your real estate transaction, you can't rely on "special deals" or promises that appear too good to be true. You can't settle for a façade of lingo. 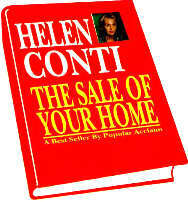 Helen Conti has a knack for selling homes. It seems to come easy for her - although the truth is, she works very hard to be a best seller. Buying or selling a home requires a Realtor with a proven track record and unparalled credentials. In essence, one that supports words with actions. Helen's dedication to her work affords her a vast knowledge base within the housing industry. Whether it's home construction or home locale, Helen provides the information necessary for you to make "The Right Choice." So let Helen Conti turn the key of success into the key of your dreams. "Serving Your Future Real Estate Needs"